Finally, a day to cook! Last week was too busy and we were out and about the entire holiday weekend, so I was excited to have the time to try something new on Sunday. I planned out our meals for this week and decided to grill filet mignons yesterday. 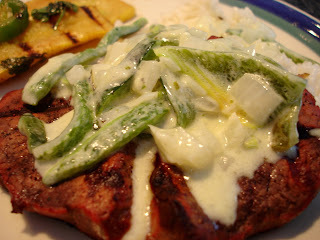 But since I always have to try something new, I was browsing through recipes on the Epicurious web site for ideas when I came across this one for Filet Mignon with Rajas Con Crema, or roasted poblano strips in cream. I love poblanos and cream sauces, so I was instantly in love with this recipe. We - I mean, Jon - kept the filets simple. Just some salt and pepper then onto the grill. I have to brag a bit here...these filets were probably the best cooked of any filet Jon has ever grilled. They stayed juicy, had beautiful grill marks, and were cooked exactly how we both prefer. Char chiles over gas flame or in broiler until blackened on all sides. Enclose in paper bag. Let stand 10 minutes. Peel and seed chiles; slice thinly. Heat both oils in large skillet over medium heat. Add poblanos, cream, and epazote, if desired; simmer until rajas thicken slightly, about 3 minutes. This recipe made enough for 4 steaks, but it was nice to have some extra for the rice. It had a touch of sweetness from roasting the poblanos, but not too sweet. I loved it, Jon thought it was good, but I've decided that a cream sauce on a steak is a bit much. Yummy, yes, but not necessary! I picked up some yellow squash and decided to grill them to go along with this meal. But first, I wanted to infuse them with some flavor, so I made a marinade. The squash marinated in this mixture for about 2-3 hours before Jon grilled them. I can't believe how quickly they took in all of the flavors! 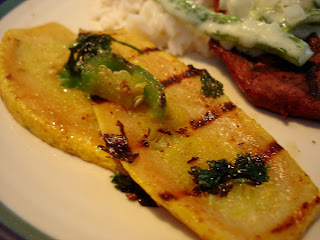 We both loved them and I'd make this simple marinade again, especially for veggies. Now it's back to work for the week - it's always so much harder after a long holiday weekend! Hope everyone had a good one!